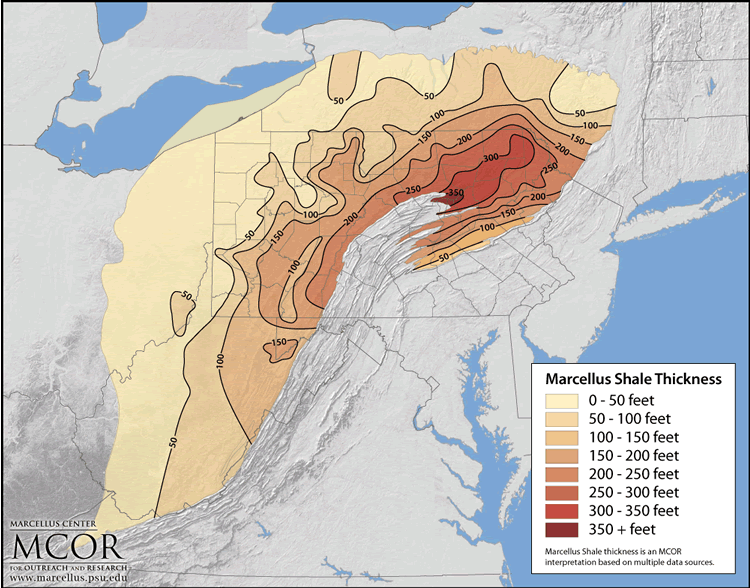 The Marcellus shale is an organic-rich black shale that was deposited in an oxygen-deficient marine environment during Middle Devonian time (~390 million years ago). Long known to be a source rock for many conventional oil and gas reservoirs in the Appalachian basin, it is now being explored as an unconventional reservoir. The formal name for this rock unit is the Marcellus Formation. Where is the Marcellus shale located? The Marcellus shale is prevalent throughout much of the Appalachian basin and most of Pennsylvania, although its depth and thickness are variable. How are Marcellus shale wells being completed, and how is this technology different from the development of conventional oil and gas reservoirs? 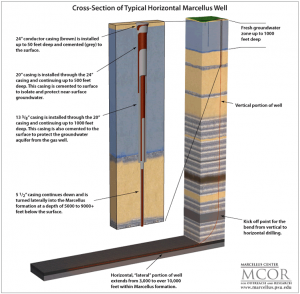 The two most notable ways in which Marcellus shale well completion differ from those completed in conventional reservoirs are (1) directional drilling and (2) hydraulic fracturing (“frac”) methods. As many as half of the Marcellus wells in Pennsylvania are expected to be completed as horizontal wells; this approach allows the operator to access more footage of reservoir than would be possible in a traditional, vertical hole. In addition, the use of “slick-water frac” methods enables operators to recover gas more efficiently and in larger quantities. Such approaches require as much as 20 times the water volume as that used in conventional well completions. The answer to this question ultimately depends upon natural gas prices and state-of-the-practice technology at the time of the assessment. Having said that, the U.S. Geological Survey has reported estimates of recoverable gas reserves in the Marcellus shale at 1,925 billion cubic feet (Bcf). Industrial and academic assessments vary from 50 to 500 trillion cubic feet (Tcf). A recent study reportsa Marcellus shale gas recoverable reserves at 100 to 200 Tcf. These estimates will continue to vary as the play is explored further.